« Say it ain’t snow! This is the second installment of the Teacher Challenge supported by Edublogs. I am going to share some things I find effective when reading blog posts. I am definitely not an expert at following my own advice! Use lists and/or bullets. We all know that it is easier to read lists than a huge chunk of text. This will help your reader pull the main ideas from your post. Keep your paragraphs short. I totally fail at this. I tend to get very verbose, but shorter paragraphs do make things easier to read. Incorporate visuals. I find posts with visuals grab my attention. When I include visuals, I like to use photographs I have taken or screenshots of things I am using. If you use stock photography, make sure it is Creative Common Licensed for reuse. Make the topic something you are passionate about. I’ve learned it really does not matter so much what you write about. What is your passion? Do you want to share ideas, strategies, lessons, useful tech tools, struggles, or a mix of all of it? That’s okay! If you are passionate, your readers will be engaged and want to read what you have to say. Ask questions. I have found that ending posts with a question results in more of your readers stopping by to comment on your post. It can be as simple as, “What do you think?”, or a more specific. As a side note, I have not linked to a post I have found to be effective because I usually read posts from Twitter links. I think they are awesome and amazing, but then I do not bookmark them or add them to my blog reader. That’s definitely something I need to work on! 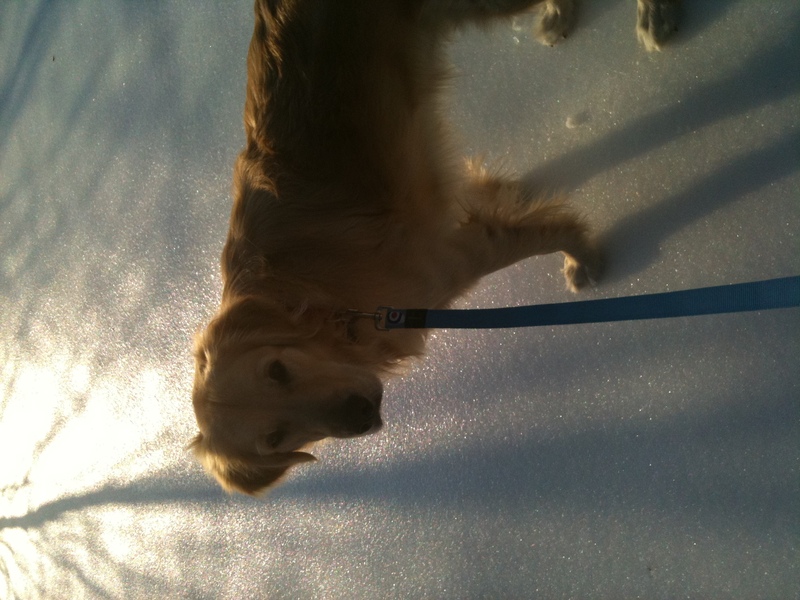 My sweet puppy in the snow, which has nothing to do with the post, but he's cute. Don't you think so? I am interested in your last comment about Twitter. I hover in it, but don’t really use it as part of education. I use it to follow a few people I am really interested in. How much time would you spend on Twitter and then reading the blogs you go to. I ask this because while I know technology has a lot to offer I just wonder how much does it take me away from the real world going on around me. I am a Twitter maniac. I like spend a lot of time on Twitter, but I don’t have the time during the school year. I usually do a quick skim in the morning before school, and then I follow closely in the evening if I have time. I also think it depends on how many people you follow; I follow over 900 people, which I realize is a bit much for the casual user. I especially take a look at recommended blog posts if more than one person mentions it. I would say all in all, on a school day, I spend about half an hour on Twitter. I should also add I am quite an introvert (so is my husband), and we do not have children, so interacting with people online is really fun for me. Kathryn, I love twitter too. When I started I only followed educationalists. I have learnt so much from them and like Janelle, I love reading some of the many blog posts that are tweeted out. Twitter also lets you publicize your blog posts and can encourage a new network for you. However, I now also follow lots of different people and organisations eg museums,authors, accountants (I teach accounting), the Queensland police so I can keep up to date with the Queensland floods etc. I like your suggestion to use visual in your post. It is something I do not do regularly as I find I spend to much time finding that perfect image that matches my post. What strategy do you use when selecting an image or visual, any suggestion to help me? I totally understand about taking time to find the perfect image. Most of my photos are actually ones I have taken. I have an iPhone and a classroom camera, so it’s pretty easy for me to snap moments throughout both my personal day and the school day. Also, if you use Google to help you find an image, it helps to go to the advanced search feature for images. Choose ones licensed for reuse under usage rights. That helps narrow down to ones that can be used, and really reduces the number of search results. I hope that helps. I am not an expert on this by any means. Great tips! I had several of the same ones for my list. I love the visuals, too. I have to remind my students, though, that they can’t just copy and paste from the Internet without being aware of copyright. Thank goodness for Creative Commons! Love the picture of your puppy. Did he like the snow? Our dog loves it. Kay, from reading the other posts for this challenge, there is a definite common theme emerging! The first lesson I gave my students on their blogs was about finding Creative Commons licensed photos for reuse. I think they thought I was a little crazy at first, but they get it now. Hi Janelle. I really like your advice on writing something you are passionate about. Passion brings the best dialogue and adding a simple question is a great idea to stimulate further conversations. Your puppy is just gorgeous. How does he find the snow? I have a new puppy (Christmas present) She is a black cocker spaniel. We just had a 43 degree centigrade day and she did not like the heat! Thanks, Anne! My puppy LOVES the snow. He really likes to eat it. 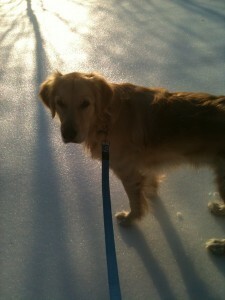 It’s covered in a layer of slippery ice, but he doesn’t mind slipping and sliding. I am ready for it to start melting now. Janelle, I forgot to say that I use bullet points and lists a lot as they are quicker to post, make the focus of the post quite clear and adds variety to text. Anne, it’s really interesting reading everyone else’s posts for this challenge. I am definitely finding that there are a lot of common themes among us – bullets and lists being one of them. By the way, I’ve never been to the snow… People have told me it’s something similar to what really old refrigerators used to have in their freezer compartment, is it right? Good question about the snow. I’m not sure how I would describe it. Ours is coated in a layer of ice, which is easier to imagine. The snow itself is powdery and cold – not quite as icy as old freezers, but close. I grew up in FL, so I don’t have a lot of snow history. It would be such an amazing experience for you to share with your son. I hope you get to go! Well, I got a really good idea based on that description. Kami, I can’t wait to read about your snow experiences! I appreciate your comment about being passionate about what you’re writing about and to end with a question. I think that helps with starting the dialogue. What is the question that you’ve asked that has given you the most interesting responses on your blog? Jennifer, ironically I have not done of great job of engaging conversations before this challenge. I am sure it is largely due to the fact I post irradictaly. I am definitely working on this. My passion is learning. I know a lot of people at my university would say it is technology, but I just really like to learn new things. I read about different things, and learn all kinds of stuff. This is probably why I have tons of scrapbook stuff, even more digital and printed photos than is reasonable for any one human being, lots of books, drawing pens/paper though I am SO not an artiste, journals–both in paper and online, etc. I think I see this comment becoming a seed for a post. I love learning! So there you go! 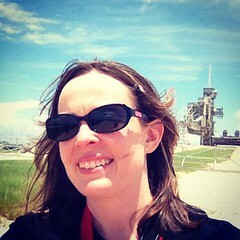 Laurie, thanks for sharing your passions with me! I love learning, too. You should see some of the nerdy books I read over the summer (like “The Telescope: Its First 400 Years”). Anyway, despite the technical problems I got you message, which is the important thing, right? I like the feeling that blog gives you that you are talking to real people who actually respond to you and you can make an impact on them as well. I also love the idea that despite the language and cultural differences we can find people whom with we share many things. I hope this will keep us (human beings) focused on what makes us more similar than on our differences. Lists and/or bullets: I am convinced that these are the key to it all. And, yes, your dog is very cute! Thanks, Stacy. I do love my dog, he’s a sweetie! I find I am as bad as my kids at times with regards to a short attention span. The lists definitely helps me with that. I’m thinking of your last step and how bloggers can open the door for comments from readers. Certainly, inviting questions and posing interesting final thoughts can help. The design element plays a role, too (how easy is it for a reader to comment). Also, creating a space that is open for evolving debate and discussion is important (although, you want to keep the debate on a respectable level). Given the number of comments here, I think you have done just that. Thanks, Kevin. You definitely have some goods points. One thing I’ve noticed with the comments here, is that breaks are not automatically being added for paragraphs. I need to look into the coding of the theme to see if I can adjust that. I am sure that would help with readability. I am also a big fan of threaded comments, as I think that helps with discussions. Janelle thanks for that reply about Twitter, and you too Anne. I think I’ll endeavour to get a little more active!